One of our most favorite products, and one that makes us unique, is our awesome balloons! We have a huge selection of specialty balloons and can make a bouquet that will be sure to brighten someones day!! One thing we use that makes our balloons extra special, is a product called hi-float. It is a liquid solution that we put into our balloons before blowing them up. It coats the inside of the balloon and then dries, helping keep the helium inside 25-30% longer than it normally would. A balloon without hi-float will stay up for a day or so. With hi-float, it will usually last 2-4 days (we have had some reports of balloons lasting for weeks!!). All of our bouquets come with hi-float, and it only costs a little extra for single balloons or per dozen. Valentines week is here! Woohoo! Pioneer Party is your Valentines headquarters - we have such a great selection of gifts for every person in your life - teacher, spouse, child, friend, neighbor, boss, and more! Come on in this week and grab one of our many pre-made gifts, or order your own specialized treat! Don't forget to order balloons (they are cheaper than flowers!)! We do personalized kids classroom Valentines too - call us for ideas and pricing! 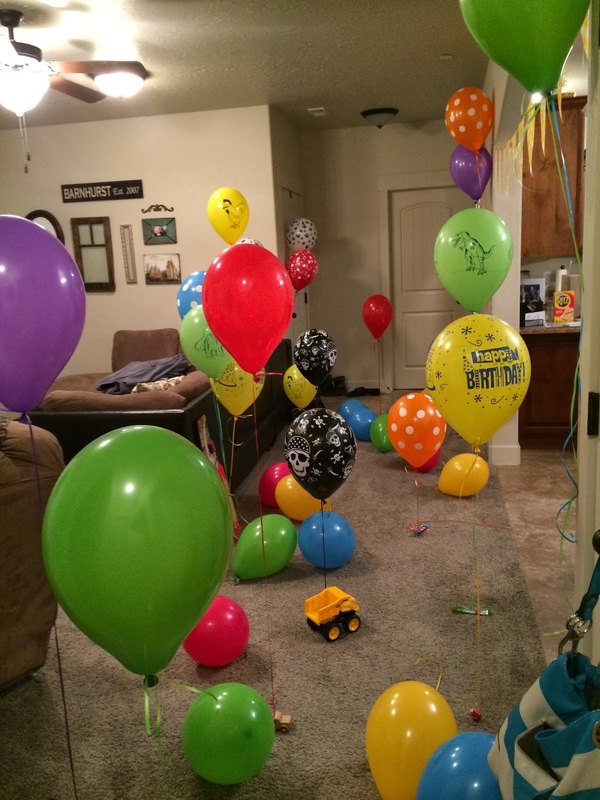 It makes the room look fuller, and especially for kids, it makes them feel like the whole house is just full of balloons! You can get small candy to tie them to, tie to doorknobs, or even just grab some toys or items already laying around. We also got 2 dozen plain balloons (no helium) and blew them up to just lay around the floor. We tied one birthday present to a few balloons so he could have it all day, and the rest of the gifts were reserved for the birthday party that night. Balloon Buddy's, Gold Coins, and Jewelry!! And check out this picture, it cracks me up!! It's Rob - our FAVORITE UPS driver, and Bob - our Balloon Buddy (made for a guest today). They're posing with a fun package - SOME NEW JEWELRY!! Most pieces we have in stock now are Buy any 2 for $12.00!! Wahoo, only $6.00 each! Grandma's 80th Birthday Party - How To! 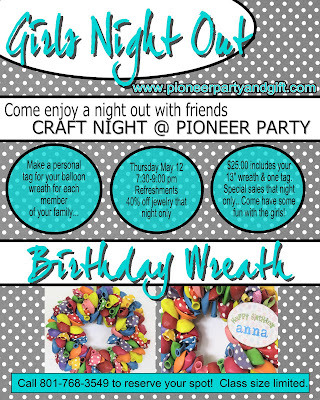 Last week a local crafter and fellow Studio 5 presenter showed us how to throw the PERFECT party for your grandmother. Take a look at all the beautiful details!! And also take note of all the fun ideas you could transfer to ANY PARTY! I especially like the balloon backdrop (of course - because they are OUR balloons), the balloon launch idea, and the paper cup light garland! How creative. Thanks Mandy!! So... plan B - check out the video here. To view text only of this segment, and for recipes - click onto Studio 5's website or Mandy's blog. Girls Night Out... An Invitation to YOU! So us girls at the party store have a monthly training meeting... Here are some pictures of us learning how to make this adorable butterfly! Father's Day is Coming Quickly! Top it off with a big bag of Swedish Fish! Now if your man doesn't like to fish, then you better come on down and let us help you figure something else out! This weather is crazy!! Two weeks ago we were in our swimming suits playing in the sand box, and this weekend we have our boots on stomping in the snow! One thing that has made me smile lately is walking into the store every day and seeing SPRING no matter what the weather is outside. Everything is so bright and cheery... maybe these pictures will give you a little glimpse into what fun lies ahead when the weather is consistently nice outside! Mini topiaries hung from the ceiling. These are unique decorations for any party - hang them above the table where you are going to be celebrating! Warmers and scented blocks. High quality and great scents! So the other day I was visiting a friend and noticed that her 16" Valentine balloon that she bought her daughter for Valentine's Day was still floating...dwindling by the ground, but still floating. Then while at aerobics class today a friend mentioned that the fish balloon that she bought her daughter for Valentine's Day was still floating on the ceiling! Wow! Over a month of float time! Definitely worth the extra 15 cents, don't you think?! Order your Valentine Balloons EARLY! Here is a SPECIAL DEAL for all you blog readers! 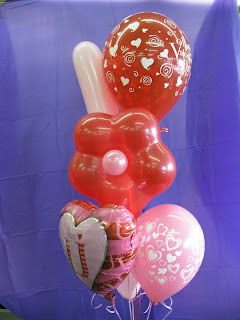 Order your Valentine balloons by Tuesday the 10th and receive 10% off your entire balloon order! Above are just a handful of the Valentine balloons we have - you'll have to come in to see all the rest! The sooner you come, the better the selection! Valentine balloons are just a must, aren't they? Kids get so excited when they have their very own bouquet! p.s. If you haven't been in our store lately - now is the time! It is FULL of flippin cute gifts, goodies, candies - etc!! You really won't believe your eyes. Come in and see! Even those of you who have shopped at Pioneer Party for years might not know all the services we offer or merchandise that we carry...so here are a few that you might not have realized we have. We are constantly looking for new and fresh items to please our customers...which is great - there are always new things when you come in! This is a picture of a darling mini Book of Mormon that has been wrapped in fabric. It is nicely made with a foldover magnet to keep it shut, and a ribbon for a bookmark. These books were sold at Swiss Days and really are great. They are perfect for putting in your purse or car... or to give to a missionary or someone who just got baptized.